Espresso Bar is a decent little modern coffee shop just off the main shopping streets linking Covent Garden and Leicester Square. It’s partly an espresso bar, partly sandwich shop with ice cream, and partly a coffee equipment shop. So if you’re in the area and need a new Bugatti espresso machine, a Bodium flask, a latte and an ice cream, then this is your one stop! (And let’s face it, if you’re shopping in Covent Garden it’s not an impossible combination). 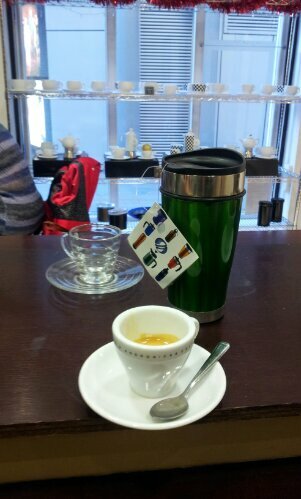 They brew a great little Andronica’s espresso – one of my favourites. There are three small tables and a long bench, so not a lot of sitting – although there may be decent seating outside in warmer weather. A good place to relax for couples out shopping, though children will probably wreck havoc with the displays.